Hope your Christmas went well. I spent the holidays with my family at my parents house in the country side, and loved to witness how the dark, cloudy and rainy December changed to beautiful and snowy white just a few days before Christmas eve. Yes, we had a white Christmas this year in all Finland. 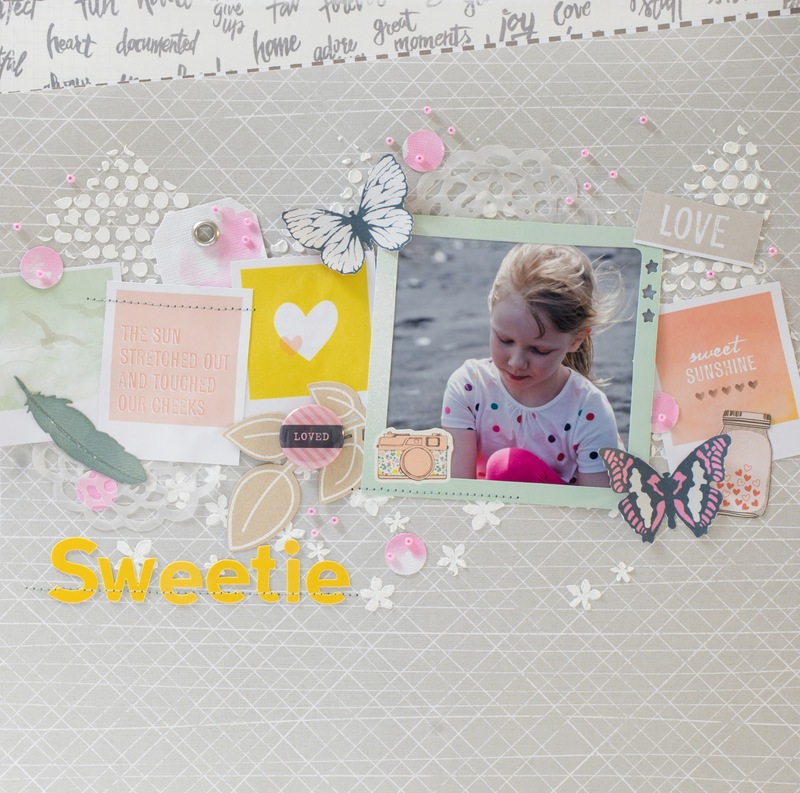 I suggest you visit her blog here for more gorgeous card and mini album inspiration. I truly love her style! I loved the fact that all the cards were bit different and unique. I made quite many of them, alltogether about 60. 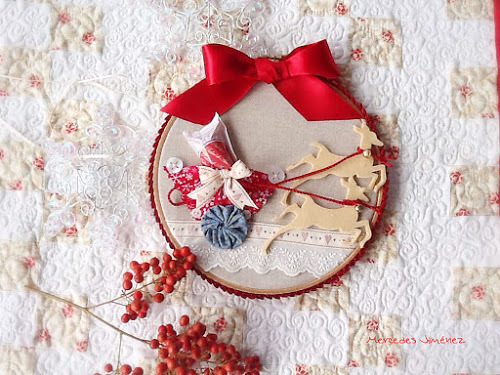 Thank you Scrapperia for the Christmas inspiration! This simple layout was so fun to make. 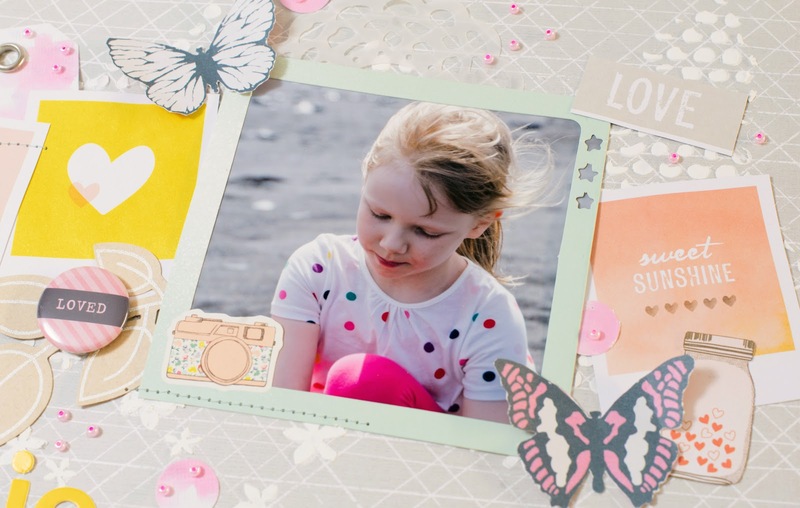 I just layered elements on the paper: Texture paste dots and flowers on the background, some die-cuts here and there, fussy cut butterflies for decorating the photo, little seed beads for adding a touch of extra pink on the project. 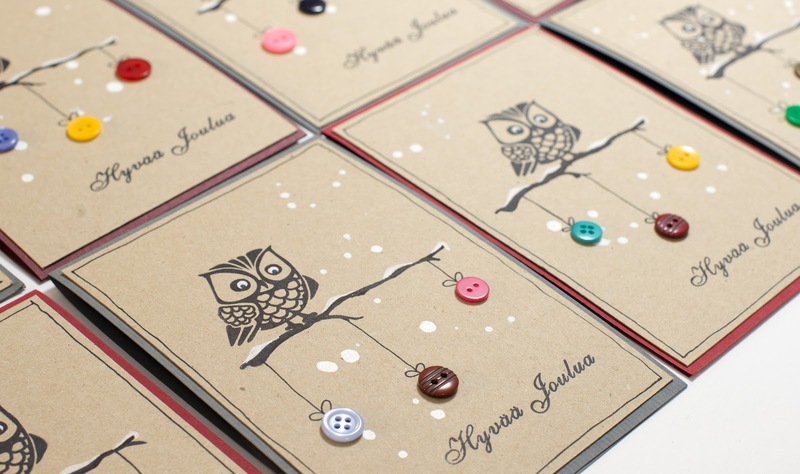 The beautiful patterned papers are from Studio Calico. The alpha stickers were attached with sewing over the letters. 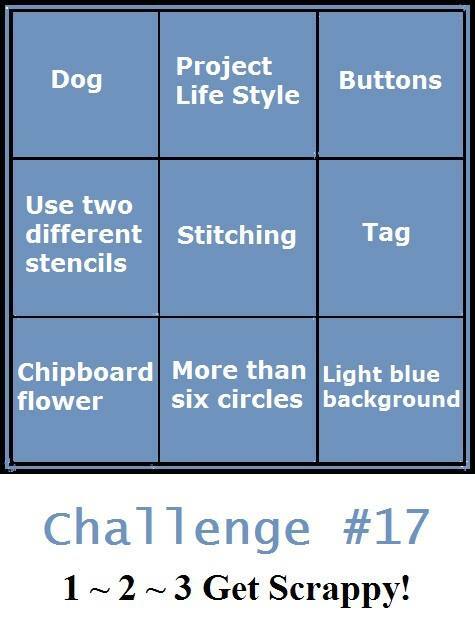 I hope I'll see your layout among the December challenge entries. Happy scrapping! 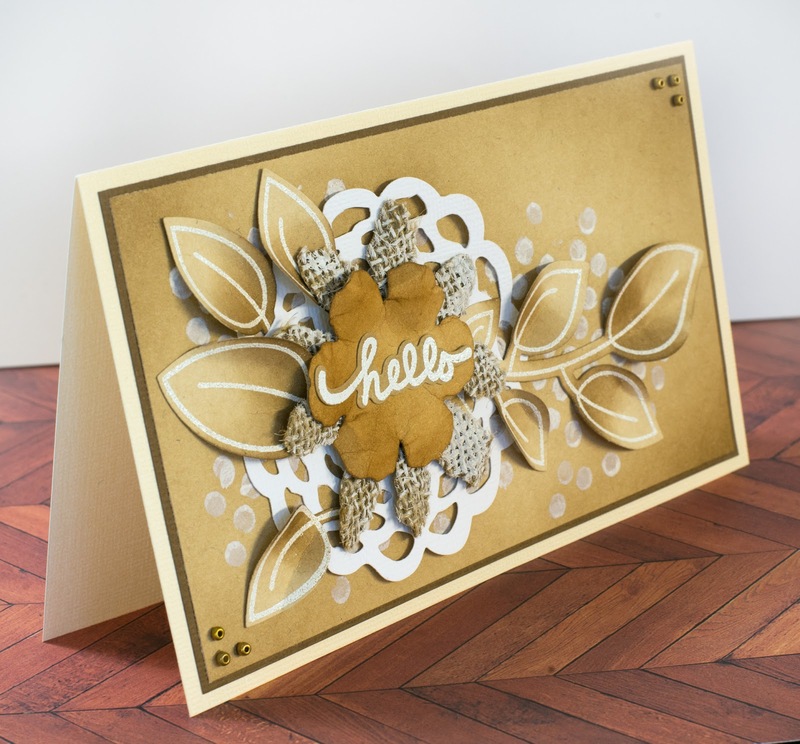 Craft Stamper Magazine Take It, Make It December challenge continues! I love using heat embossing with watercolours. The embossed image resists the colour which makes the colouring very quick, simple and easy. In addition, when colouring with watercolours it is not necessary to paint the image completely. White spaces and lighter spots highlight the beauty of the delicate watercolour textures. I prefer using liquid watercolours, but any type of watercolours would work for this technique. The paper was heavy aquarelle paper. 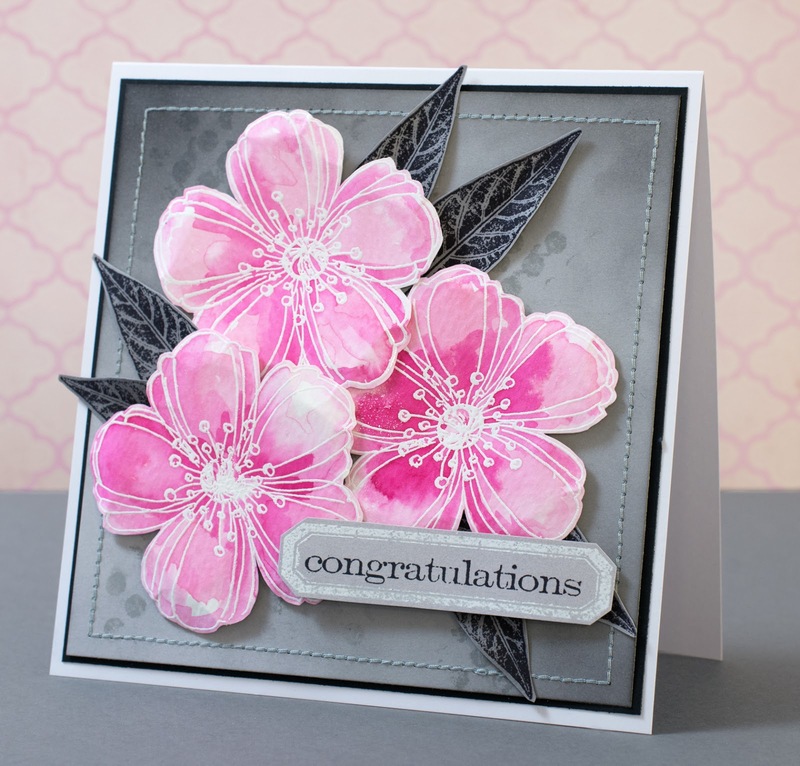 Both the flower stamp and the leaves underneath are from Stampendous collection. 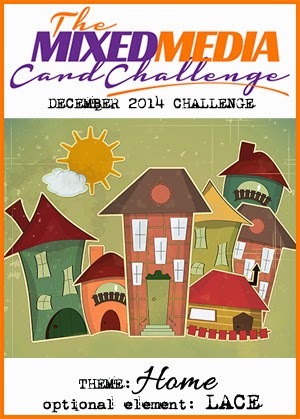 Check out all the inspiring design team projects here and here and play along! There are great prices to be won! 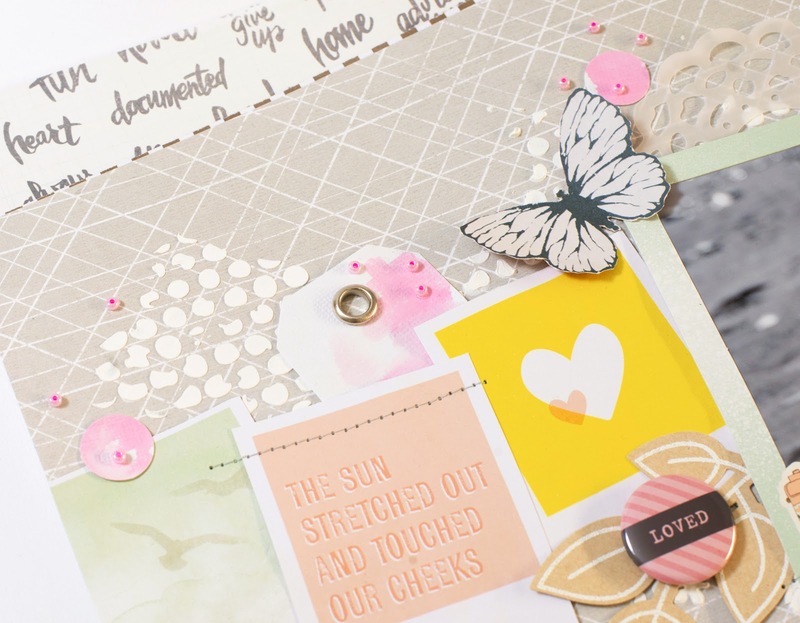 Time for another inspiring Take It, Make It challenge by Craft Stamper Magazine: Stamping with white! Every now and then I come across discussion threads in which paper crafters look for a good white stamping ink. One that would not give a solid white result and not something transparent nor vague, and that could even be used with stamps with lots of details. I don't think there's one. 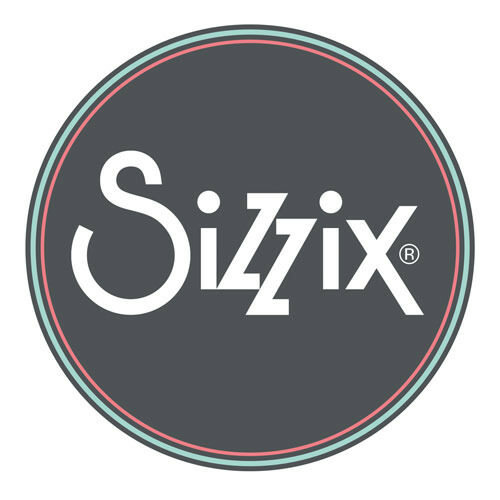 I have tried out several types and brands, but had issues with every one. Some inks are ok, but most of them don't give you a proper white, crispy stamped image. Or if they are somewhat ok, the ink pads dry out really fast. Instead of buying new white ink pads I have started using white acrylic paint and white embossing powder. Acrylic paints work best with basic images without too many details. However, acrylic paint can be used on various surfaces, and depending on the amount of paint used, the result is really white and not transparent. 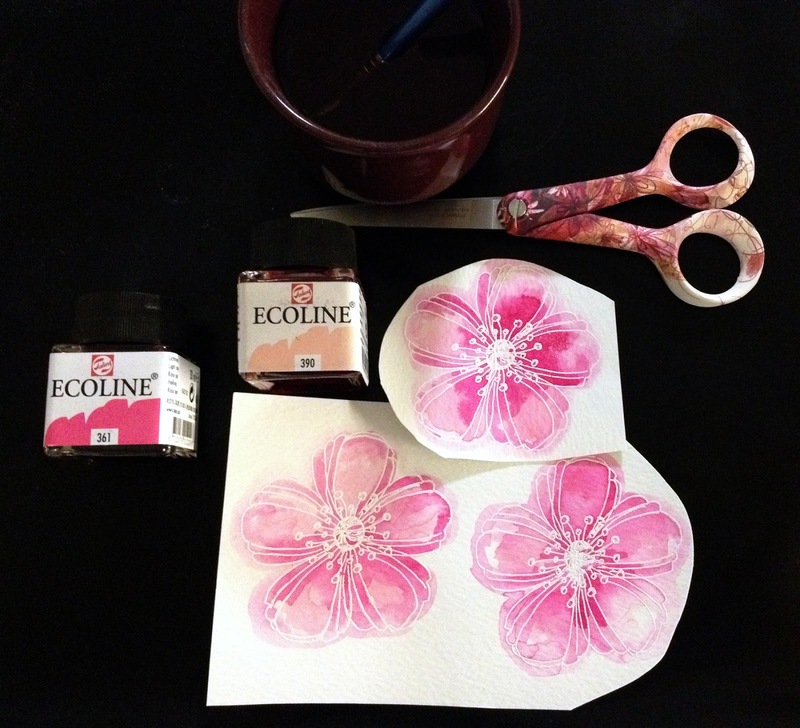 When stamping with acrylic paints I suggest you use a crafting mat as your 'ink pad', and just spread the paint on it with a brayer or a crafting knife. Do not use too much paint, as it will easily run and cover the entire stamp, and the stamp details will not be visible anymore. The thinner your layer of paint is the crispier but also more transparent will your stamped image be. 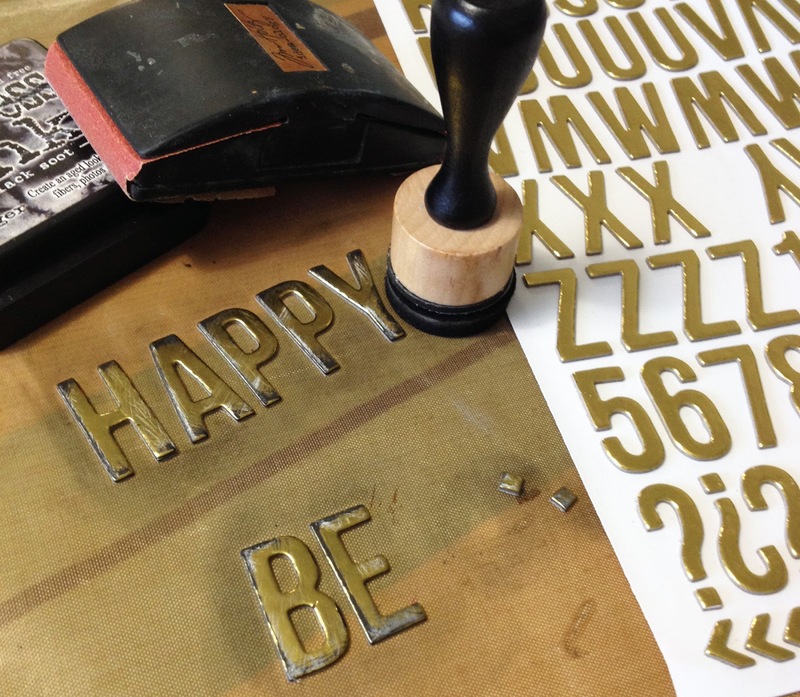 After stamping it's important to wash the stamp right away, as you will not get the paint off once it has dried. For removing the paint from the stamp I like to use an old, soft toothbrush, warm water and hand soap. 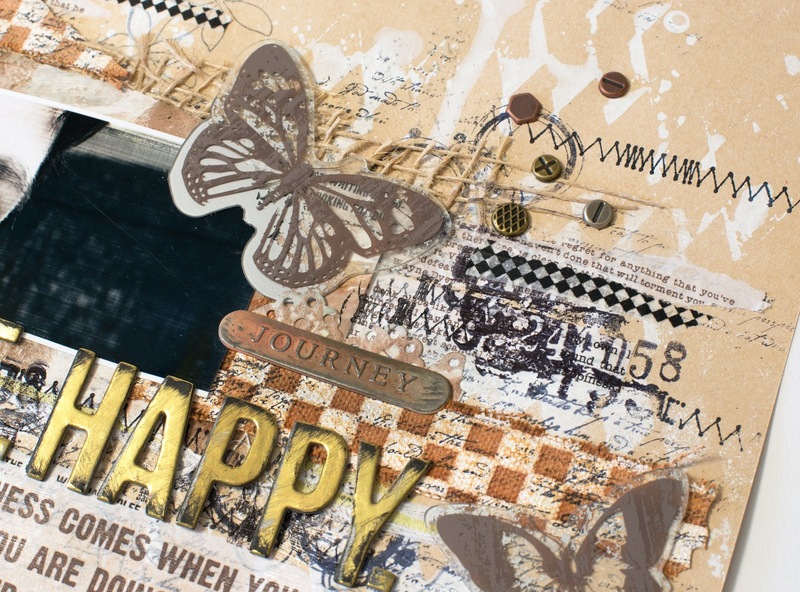 When using images with lots of details I like to use white embossing powder. 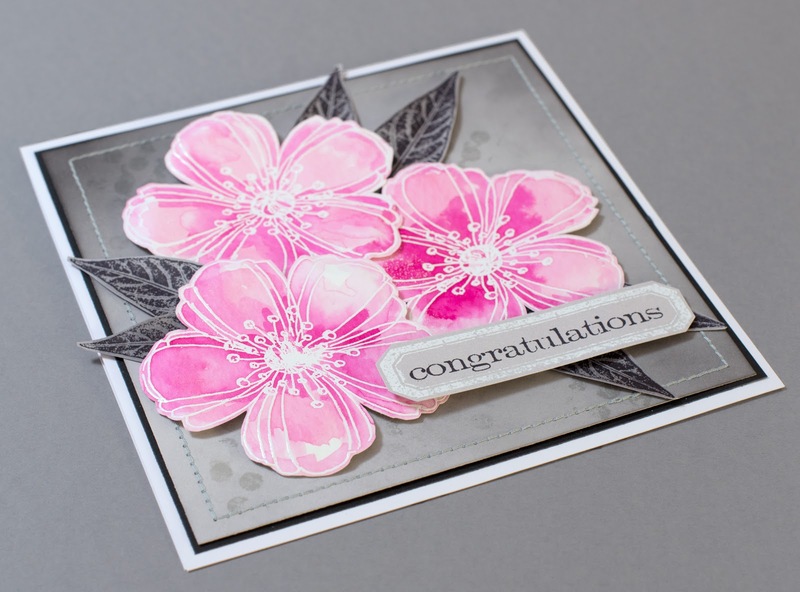 Some of the embossing powders work amazingly well with detailed stamp images. 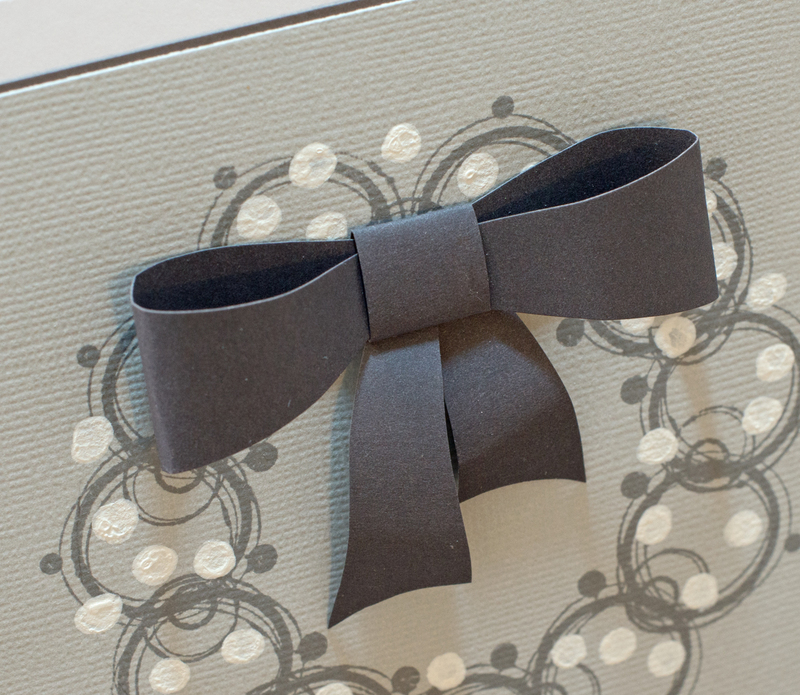 When playing with embossing powders you have several options for crating a white image - if you want to create a white chalkboard finish I suggest you have a look at this past tag project of mine, in which I used a chalkboard technique introduced by Tim Holtz. 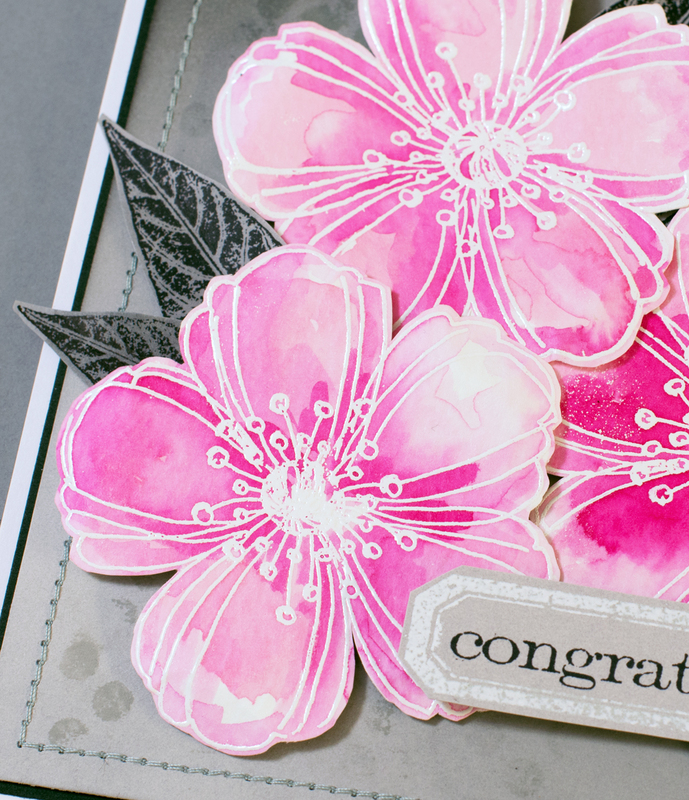 I hope you get inspired and create your own white stamping project. We have a generous sponsor this month, Rubber Dance. 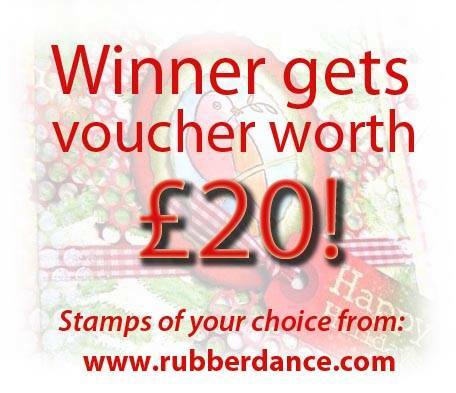 One lucky winner will get a £20.00 voucher in the Rubber Dance online store! 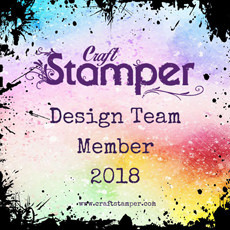 The Design Team will their Top Three projects, and the overall Winner will get published in Craft Stamper magazine! Woohoo! 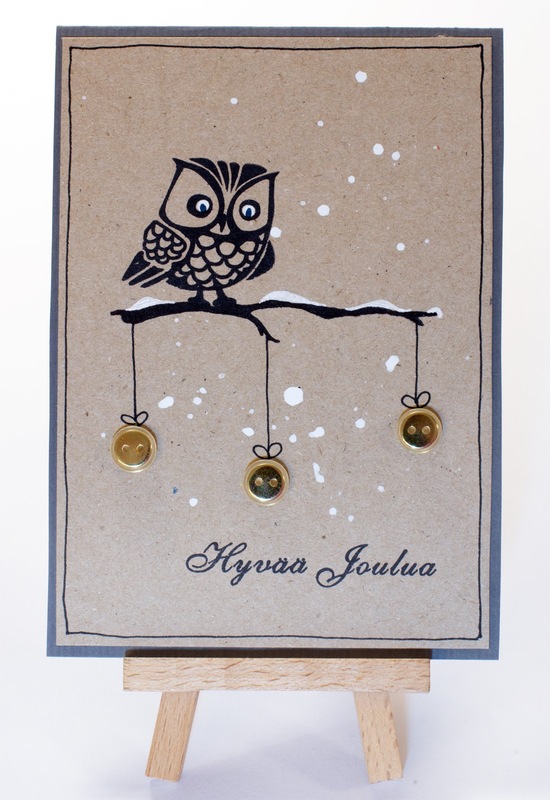 So hop over to Craft Stamper Magazine blog, have a look at the DT entries and post your own project here! 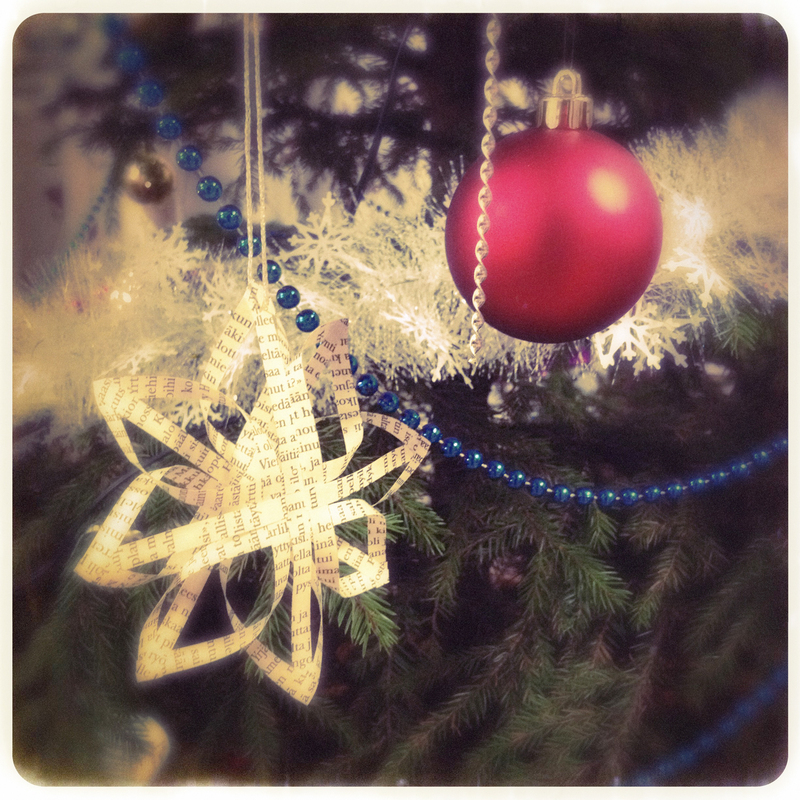 Hi to You, and happy 1st of December! The card front is cut from heavy aquarelle paper. I started with decorating the bottom part with flowers, and for that I used a flower stencil and heavy gel medium.When rubbing green inks over the flowers, the gel medium acts as a resist and the flowers remain white, i.e. the color of the background paper. The upper part of the card front is colored with light blue inks and decorated with splashing water on the inked surface. That is my favorite technique for adding extra texture! 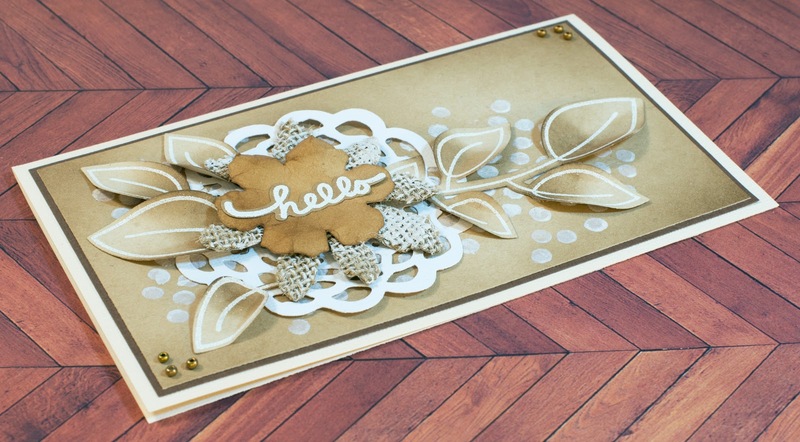 The tree stems are stamped on dark brown paper, cut out, and glued on a die-cut flowers. The die I used is the smallest size die in this nesting die set. 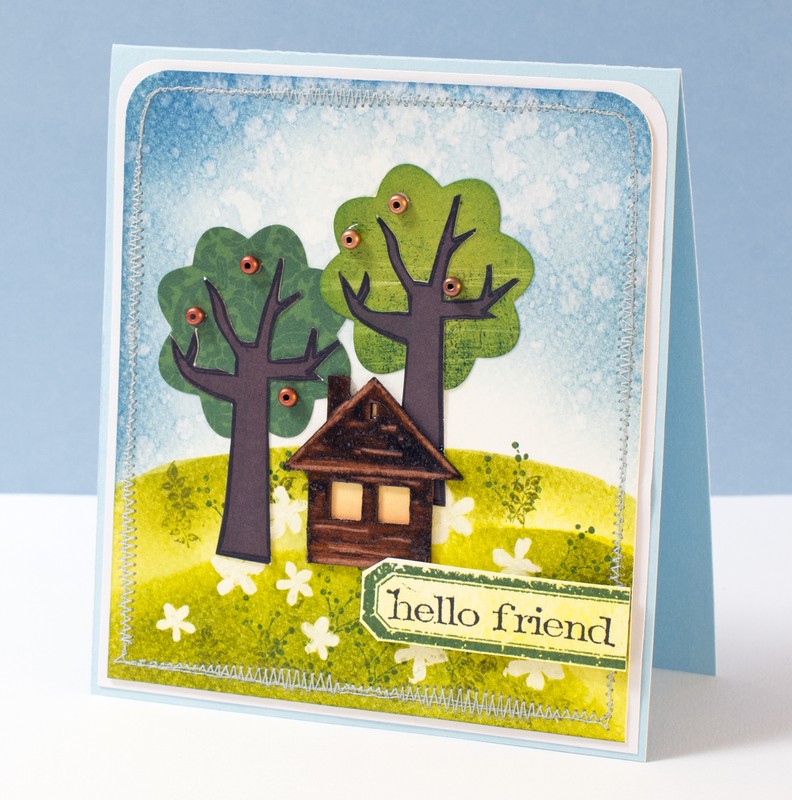 The chipboard house is painted with several layers of brown Glimmer Glaze by Tattered Angels. Before the paint had completely dried I rubbed the paint with a toothpick and removed some of the paint. 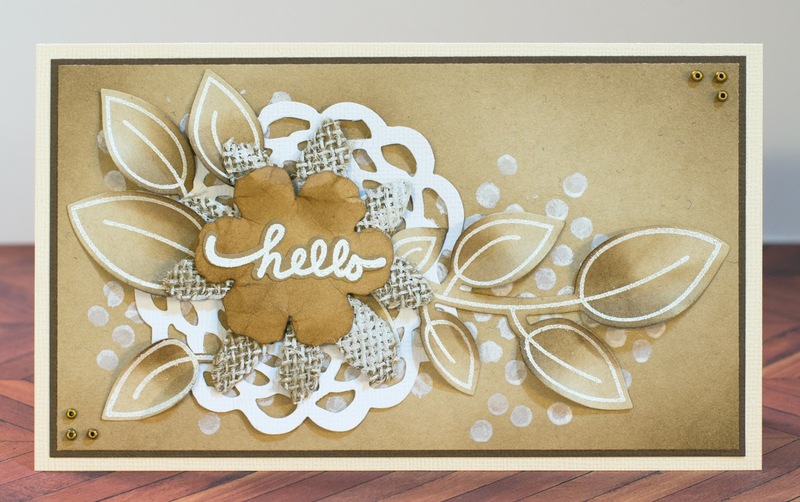 I suggest you hop over to MMCC blog and view the entire collection of amazing cards the design team has made for your inspiration. 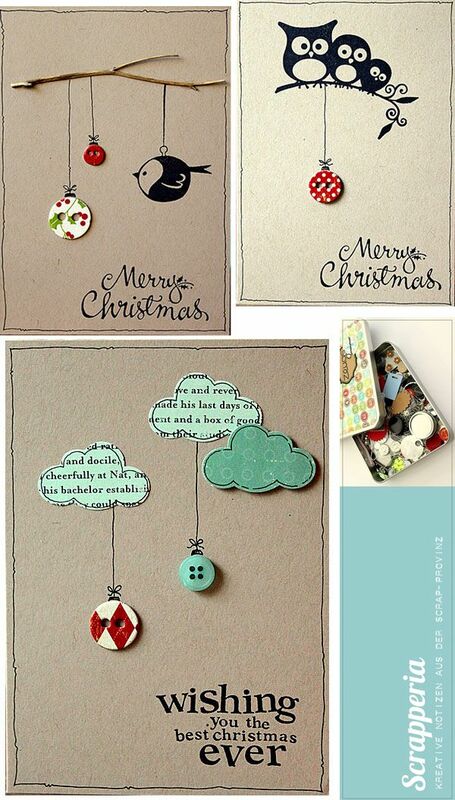 Many of the cards are Christmas themed, so if you are missing tips for your Christmas cards I recommend you take a look! 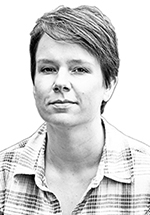 Oletko kokeillut käyttää stanssauslaitetta tilkkujen leikkaamiseen? Jos leikattavaa on paljon, stanssauslaite nopeuttaa työtä huomattavasti. Ja mikä parasta, tilkut ovat aina taatusti saman kokoisia! This month's Craft Stamper Magazine Take It, Make It Challenge is all about stamping Christmas themed projects using regular, every day stamps. The team has made gorgeous projects for your inspiration; check them out here! 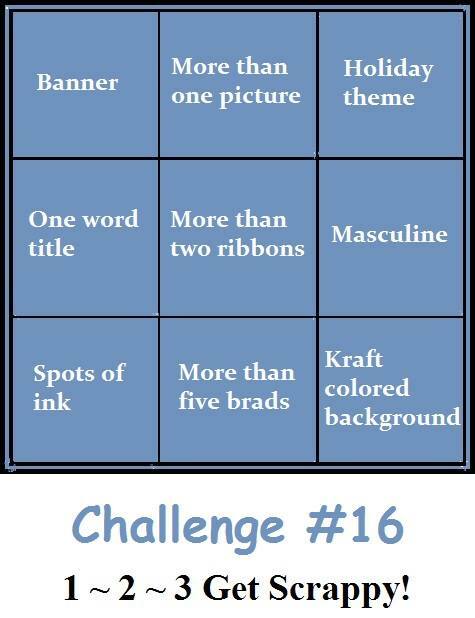 I loved this challenge. It really made my look at my stamp stash in a new way. I think I should do it more often - that's what creativity is all about, right! 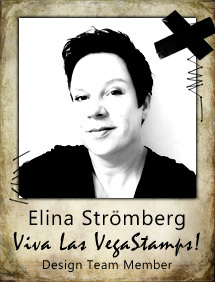 So get out your stamps and card supplies and play along! Great prices to be won - check out the details here. Thanks for stopping by, wishing you a nice weekend! Layout for 123 Get Scrappy DT: Be. Happy. I have to admit that some of the past grids have been quite challenging for me. But this one contained so many great combos to choose from! First I started collecting materials for the left vertical line, but after I wanted to use a kraft colored background, I decided to go with the bottom row: Spots of ink - More than five brads - Kraft colored background. The background is misted with a white chalk mist, using a diamond shaped stencil. After misting I removed the stencil, turned it around, and stamped with it a few times on the paper. The additional splashes and paint drips are made with white acrylic paint. 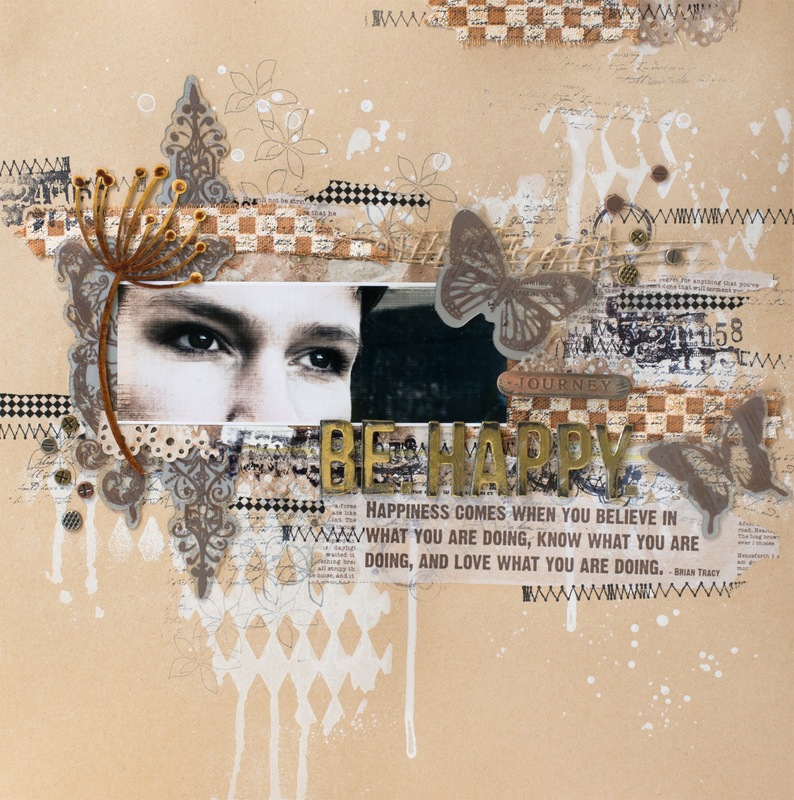 The background is embellished by stamping and layering various elements like tissue paper, fabric ribbon and mesh, brads, chipboard embellishment, washi tape, strips of resist canvas, foil stickers, and die-cut painted papers. Most of the items I glued down using gel medium just because it's so easy and fast to use. When this project was finished I had really sticky fingers for the rest of the evening, lol! 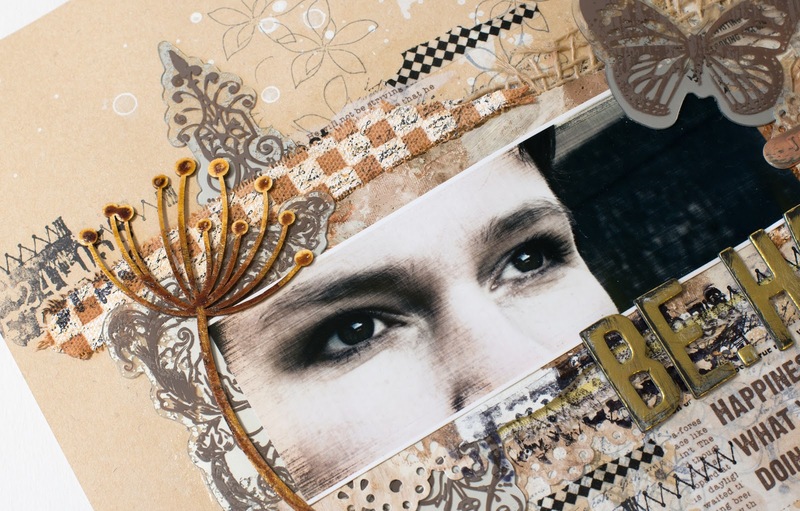 Resist canvas, foil stickers and brads are from past Prima collections. I loved the golden alpha stickers by American Crafts, but they appeared a bit 'too shiny' for this project. For creating them a grungier look I sanded the edges, and inked the sanded parts with black Distress ink. I think the letters now look way more interesting! I love making this type of projects;to let my creativity loose and just have a lots and lots of fun! 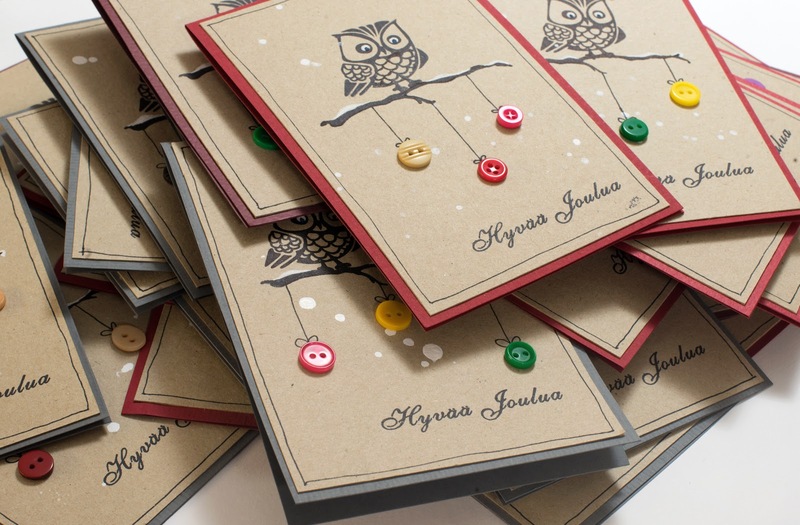 This must be the busiest season for all card makers. I'm also slowly getting myself into Christmas card making mood, and this month's Craft Stamper Take It, Make It challenge was just perfect for getting those creative juices flowing. 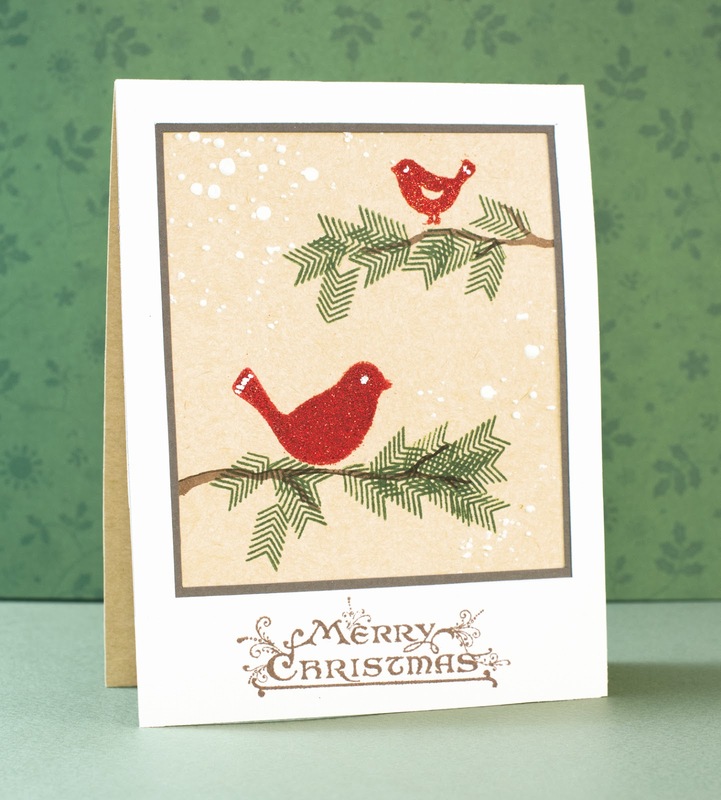 This month we were challenged to make a Christmas card without Christmas themed stamps. Cool! This challenge made me look at my stash with a fresh eye. As much as I love shopping for new crafting goodies, I also try to look for inventive ways to use what I already have. 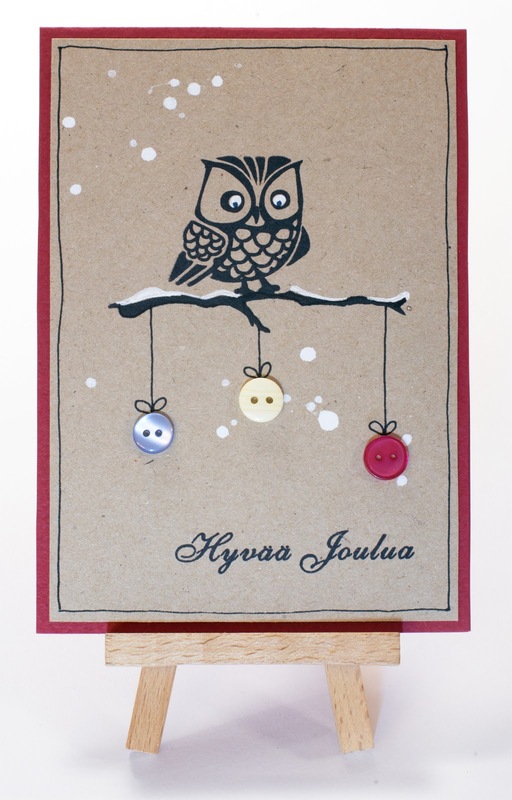 I suggest you hop over to Craft Stamper blog and have a look at the gorgeous Christmas cards of the TIMI design team has made. And all of them without any Christmas stamps! I started with tracing a circle on the light grey cardstock. 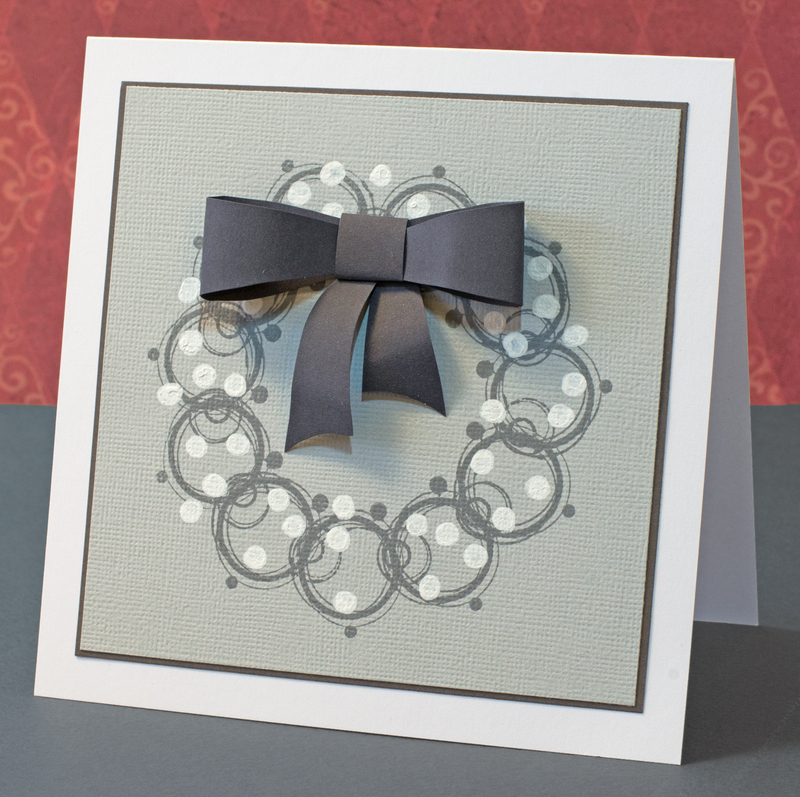 For this I used a thin metal circle die set as stencil; I love to use a nesting die set for this as there are always various sized stencils to choose from. 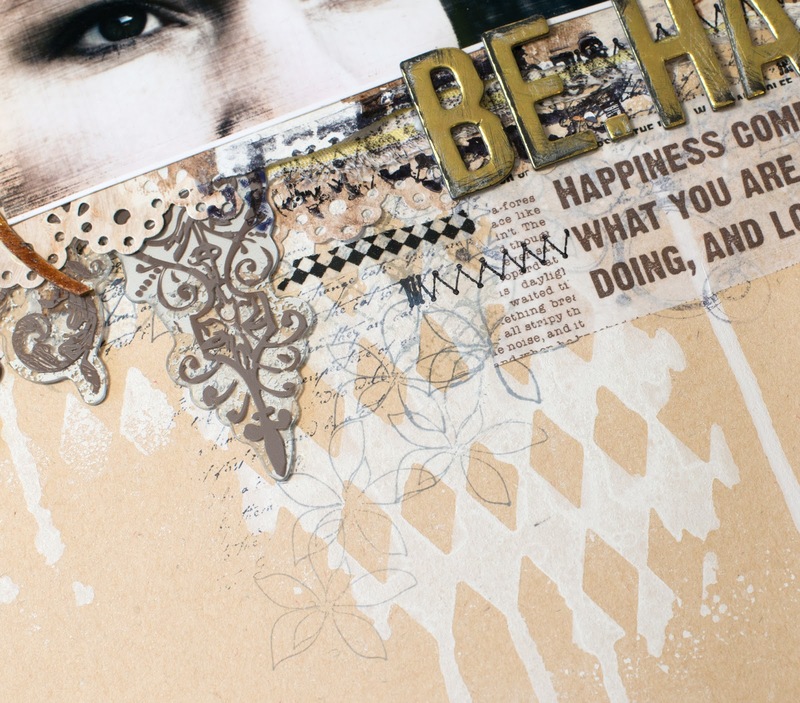 Using my circle stamp and grey ink I stamped images next to each other inside the traced circle. Before stamping on the grey cardstock I stamped a wrench on scrap paper - just to make sure that my stamped circles would fit nicely inside the traced circle. The white spots are stamped with white acrylic ink using a cotton bud. Simple and easy! 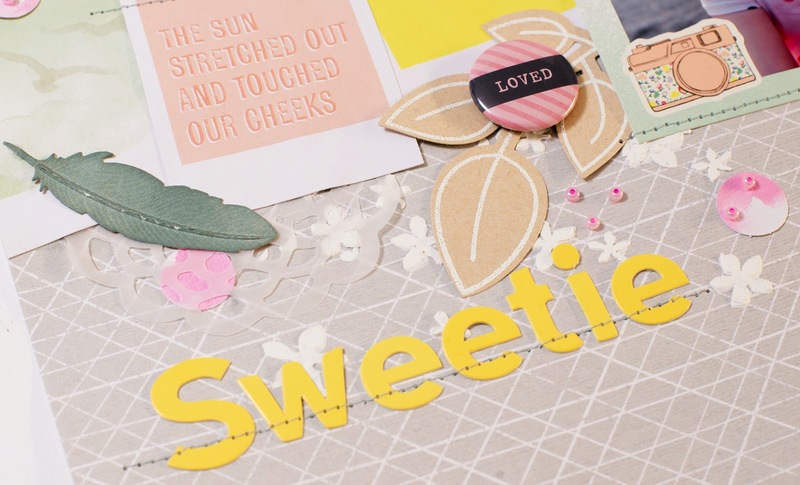 I did not have a die for cutting the pieces for the bow (could have used this lovely Tim Holtz die by Sizzix), so I ended up cutting the pieces with scissors. I curved the lower 'ribbon' pieces a bit for creating dimension on the bow. 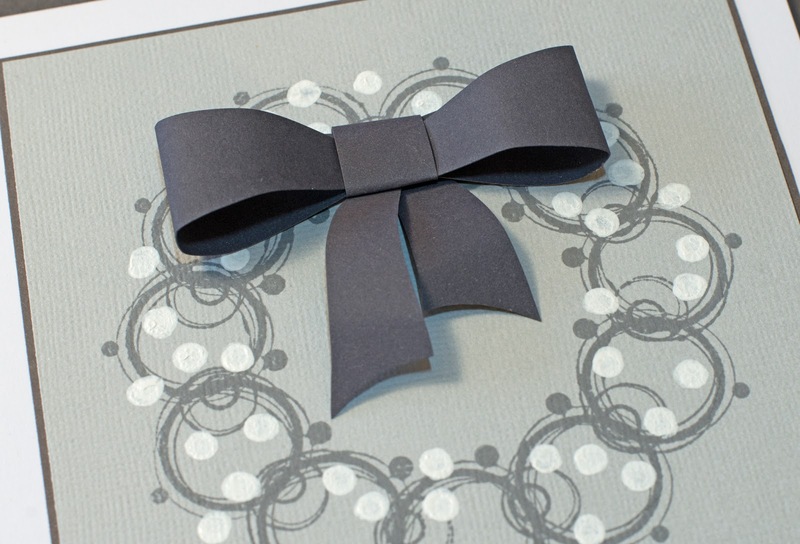 When the card front was finished I mat it on dark grey cardstock; the same material I used for the bow. I think my card turned out quite nice. Maybe I'll be making more of these for my friends...? 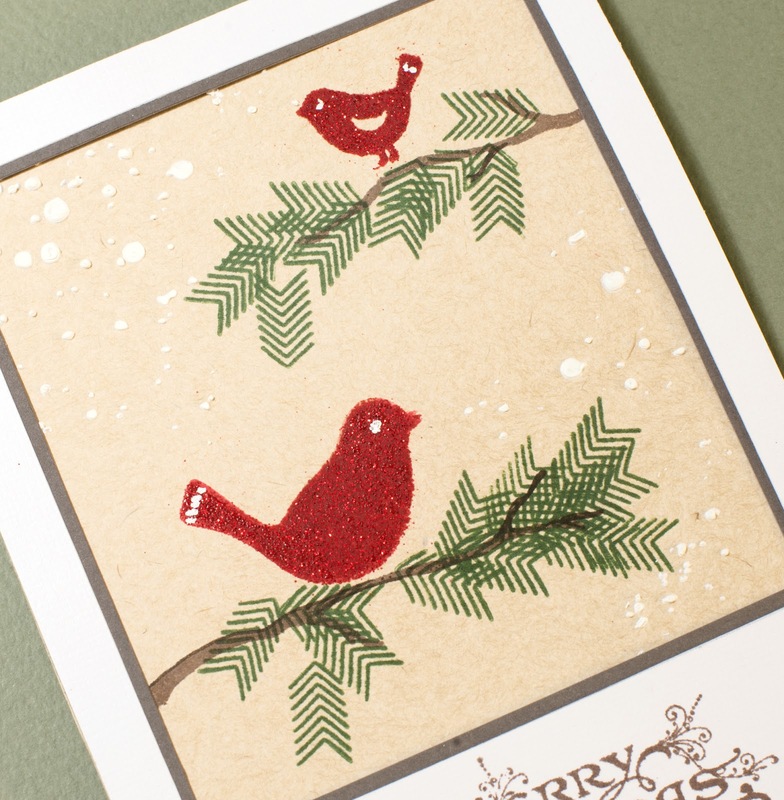 I'm always looking for new ideas for my Christmas cards, and I can't wait to see what you create! 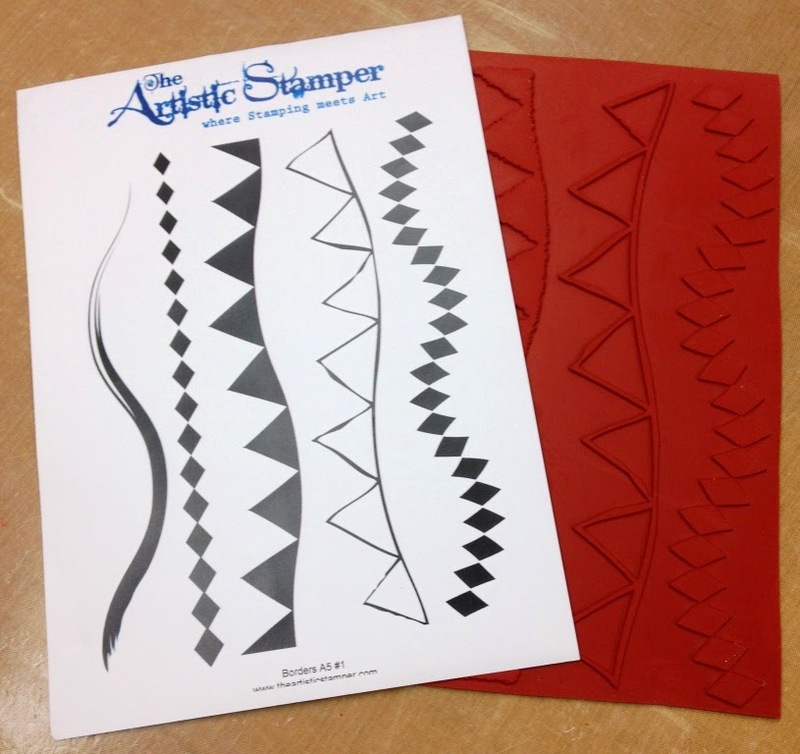 We are have a great sponsor for this months challenge, The Artistic Stamper. What a great price, don't you think!